1. A dependence on quantitative observations. 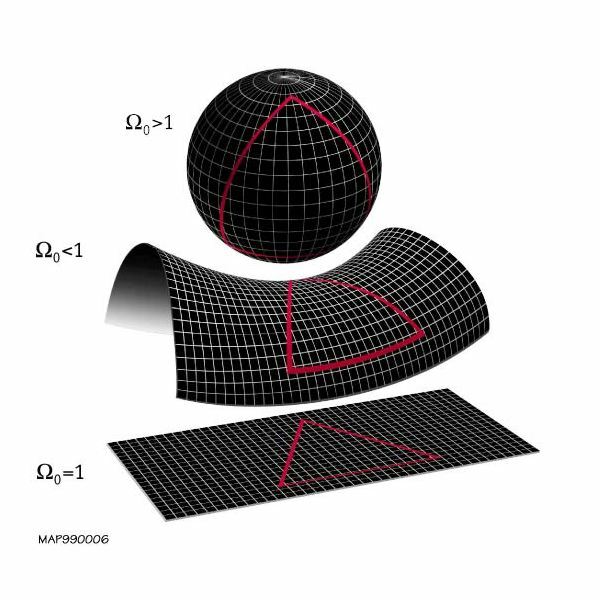 that are formulated in logical and mathematical terms.Thus we will find that modern Astronomy is really a particular instance of applied physics. Two fundamental components of Astronomy are understanding Earth's place in the universe and how it got here. Through the study of deep space, we have explored the size, shape, age, and nature of the universe. 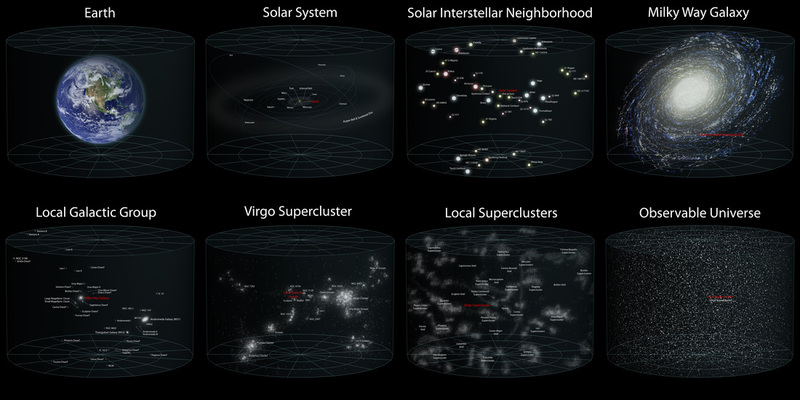 The images below show the relative sizes of the various classifications for the dimensions of space. Edwin Powell Hubble is most famous for two discoveries. The existence of other galaxies in the Universe beyond the Milky Way, and for observing that the Universe is expanding. At age 30, Hubble had an undergraduate degree in Astronomy and Mathematics, a legal degree as a Rhodes scholar, and a PhD in Astronomy. He was researching nebulae in 1924 when he announced the discovery of a variable star in the Andromeda Nebulae. He calculated that it was much further away than anyone had thought and that it was not a gaseous cloud inside our galaxy, but was in fact a galaxy of stars just like the Milky Way. His discovery led to the discovery of countless other galaxies and the realization that the Universe was much bigger than previously believed. 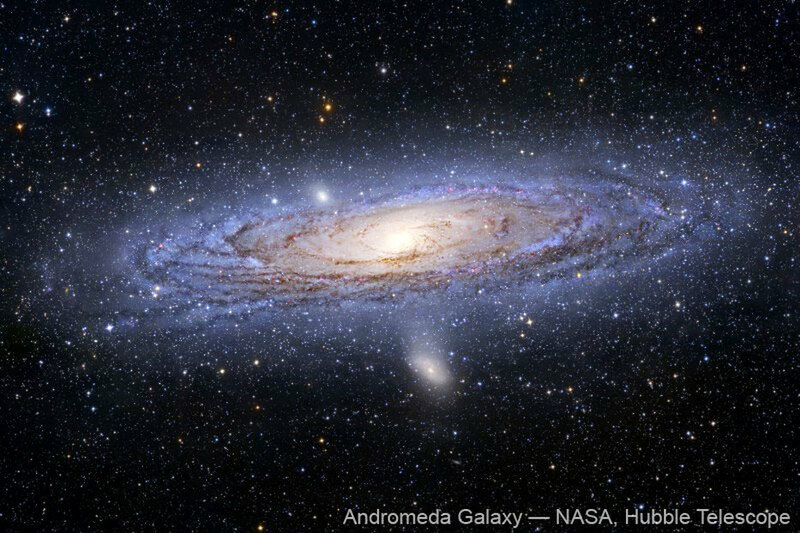 The image below was captured more recently by the Hubble telescope (named after the renowned scientist) and shows the Andromeda Galaxy. Hubble wanted to classify the galaxies (Scheme below), which started the observations that led to perhaps is most famous discovery; that the universe is expanding. By observing the red-shifts in the light wavelengths emitted by distant galaxies, he saw that galaxies were moving away from each other at a rate constant to the distance between them (Hubble's Law). The further away they were, the faster they moved away. This led to the realization that the entire universe must have started from a single point where the expansion began, and that was the beginning of the Big Bang theory. Hubble calculated the event took place approximately 2 billion years ago, but more recent estimates have revised that to 13.7 billion years ago. The discovery of the Big Bang began with Edwin Hubble, but another key contributor was Bell Labs, today's AT&T Phone Company. During the 1960's, Bell Labs hired two scientists, Arno Penzias and Robert Wilson, to figure out what was interfering with TELSTAR satellite and causing the annoying hiss in the telephone lines. Little did they know that what they set in motion would lead to the discovery of the baby picture of the universe... the microwave background image produced by the big bang itself!!!! Cover of Life Magazine 1960. Arno Penzias and Robert Wilson standing in front of the Echo satellite in Holmdel, New Jersey. Penzias and Wilson discovered the microwave afterglow of what they believed was the leftover heat from the Big Bang, but their measurements were not accurate enough to have a clear image of what that universe looked like. 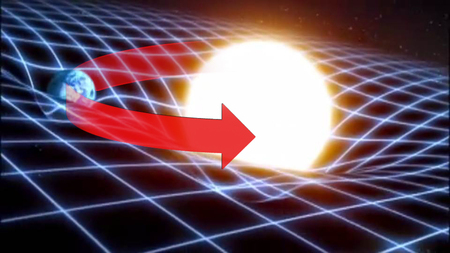 The problem was in correlating their data with the expanding universe shown from Hubble's observations. The data they got from Echo antennae showed that the universe right after the Big Bang was uniform in its concentration of matter in every location. 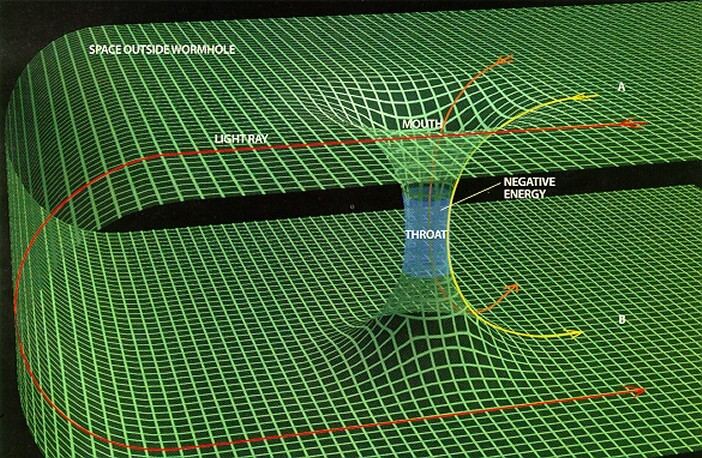 In order to get a universe to have the structure that it shows today, there would have had to be locations in the beginning that had more material than other locations. WMAP, which stands for Wilkinson Microwave Anisotropy Probe, is the name of the satellite that NASA sent out to collect the data to form the map of the universe after the Big Bang. 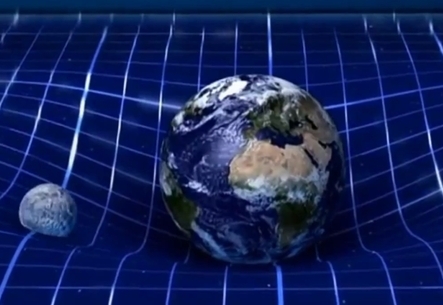 The image above to the right is a map of the universe as it existed 380,000 years after the big bang occurred. It took the universe that long to cool to the temperature at which regular matter could form... at that moment, the light from the BIG BANG leaped forth into the universe. 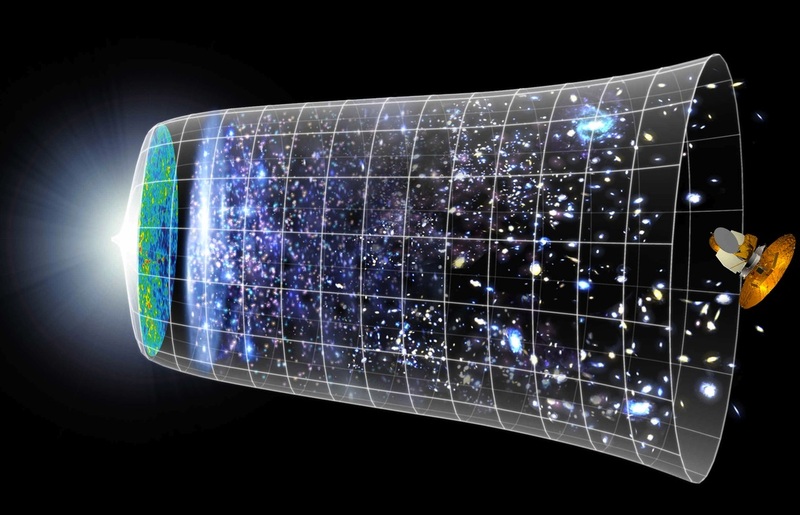 Though we cannot say for sure that the Big Bang was indeed the beginning of time (because anything before it would have been destroyed by the event itself), the data makes a strong argument for it being the origin of the known Universe.